Welcome to the home of the worlds best Motorcycle Graphics. The Image Works motorcycle graphics service is second to none, with the country's and probably the world's largest database containing over 100,000 motorcycle decals, old, new, vintage, obsolete or rare models are all available to order. Dropped your brand new superbike and scraped the stickers? Called the manufacturer and nearly passed out when he gave you the price of OEM replacements? 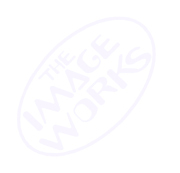 Problem solved, just call The Image Works ? Want to make your road bike look just like a factory Moto GP bike? Put off by the cost of paintwork or worried about resale value of a painted bike? What about doing it all with vinyl that can easily be removed when your hero retires or changes teams? Problem solved, just call The Image Works. A common problem with Aprilia original decals, particularly on the 2001 RSV Mille is "crazing" of the matt finish. Which can completely ruin the looks of an otherwise immaculate bike. If your bike is suffering from tired looking OEM decals give us a call and we can return your bike to it's former glory ! In the unlikely event we don't have the logo you require we will be happy to set it up for you at no extra cost! 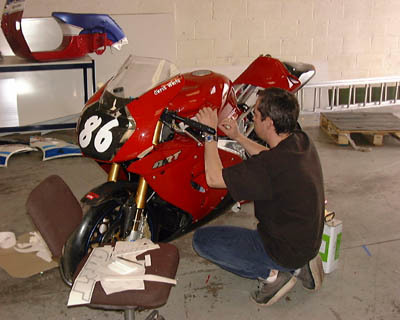 We offer a huge range of "pattern" replacement decals for original graphics to enable you to repaint or restore your motorcycle to it's original condition. Whether you ride a 1950's classic or a brand new Super Bike we can supply the decals you need. Alternatively, if you are planning a Race Replica paint job for your bike or scooter, we offer a massive choice of complete decal kits containing all the sponsors logos you need to create an exact replica of the original. A Full fitting service is also offered (by prior arrangement) at our Ilkeston premises, simply call in advance with your requirements, tell us when you'd like to visit then come along and watch your bike, scooter or helmet be transformed. We'll even supply the tea. If you require club stickers for your bike club or owners club, we can help you with that too. Just give us a copy of your logo if you have one and we'll do the rest. If you don't have a logo yet we'll design one for you. All our stickers are made from 10 year life vinyl, the best you can buy. Most sticker companies keep the prices down and their profits high by using inferior materials, they may look great when you first fit them, but six months down the line, when they have started to shrink or fade you will wish you hadn't bothered. We make our decals up to a standard NOT down to a price, you may find cheaper, YOU WONT FIND BETTER !